We have a windy morning at the inlet. Winds are blowing out of the West-Northwest at 15 mph, gusting to 22 and the water is choppy. NOAA has a small craft advisory in effect for winds through late today. Winds will begin to diminish around sunset but poor boating conditions will continue into the weekend. The bite has been a little slow the past several days. Large Bluefish are the most active species. A smattering of Pompano and Sheepshead, and a few Whiting have been landed. A few Snook are being landed at night. Our angler of the day is Dwayne Vincent. Dwayne had a great day when he was able to scratch an item off his bucket list. 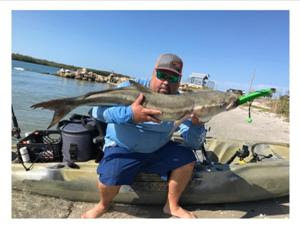 Dwayne landed the 36" Cobia in the photo from his Hobie Outback kayak using an ESA trout rod with a 3000 reel with 15 lb. braid and a 20 lb. leader with a butterfly jig. He landed this beautiful fish inside the inlet on the outgoing tide and it was pulling him out of the inlet! He sends out special thanks to Jesse Austin and Jerry Boggs who let him jump in their boat which enabled him to land the Cobia!